Home » Around the farm » It’s a long walk for little legs. It’s a long walk for little legs. 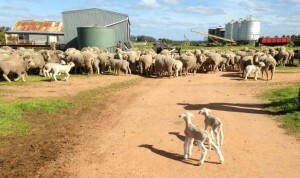 It’s made this week a busy one as mobs of ewes and lambs have had to be brought home to the paddocks around the house, to the yards, drafted and put in the shed to ensure they are dry for the shearers. While some mobs have been trucked home, others have made the trip home on foot. 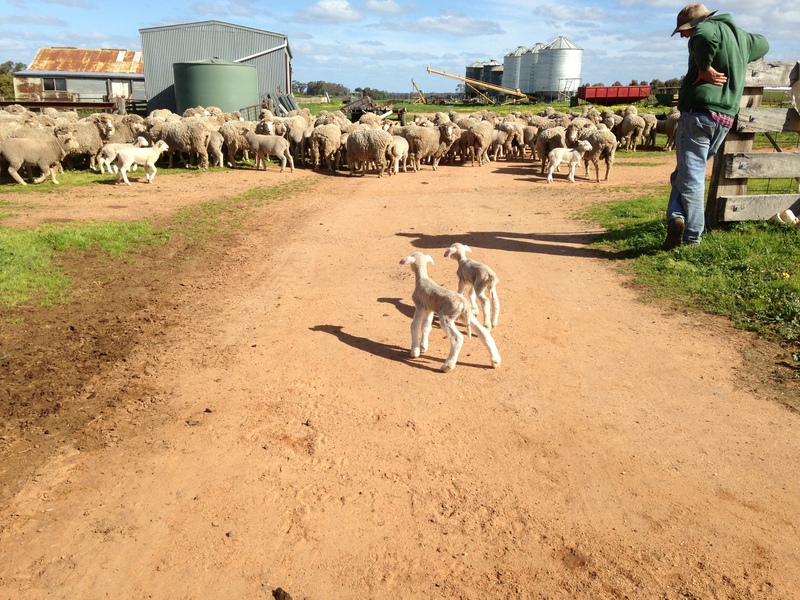 One of yesterday’s jobs was to walk the mob home from Mooreheads – a paddock down the road, about 4kms from home. There was a time when Tim’s dad would have done a job like this on his own, on horseback, with a dog or two. Yesterday we did it with three people, two utes, two dogs and a wheelie bin. 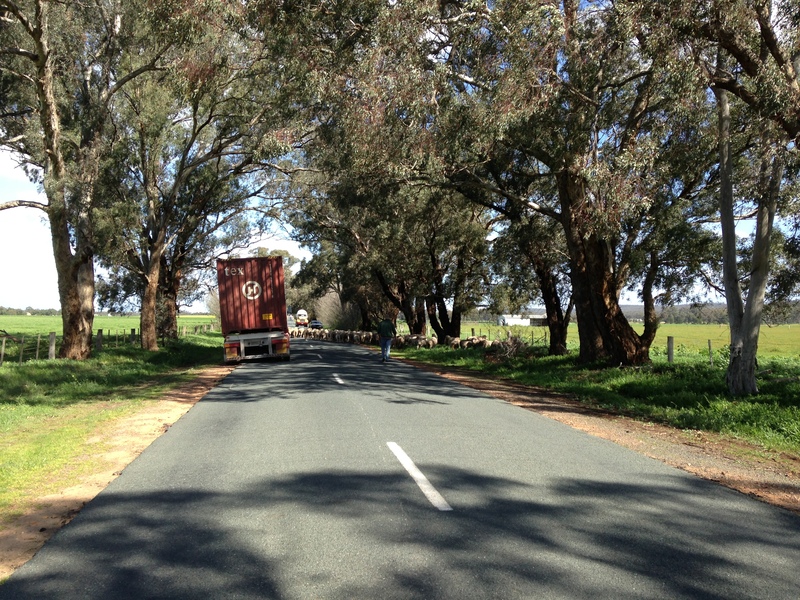 Moving stock along our road has become a difficult and sometimes dangerous task. What was once a comfortable stroll along the road now has to be planned with the precision of a military operation – what day of the week is it, what is the best time of day to avoid the most traffic, is it the start or finish of school holidays or a long weekend. 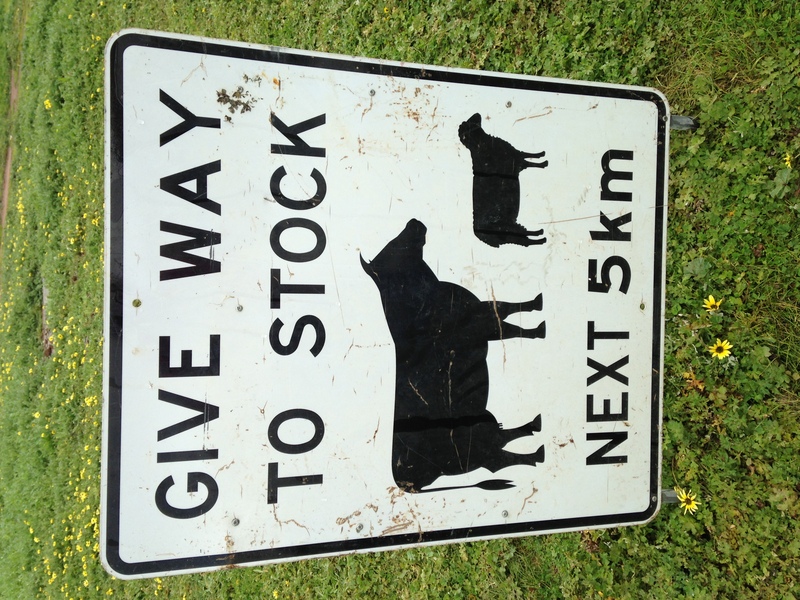 We also have to abide by the regulations now in place about moving stock on the road – stock-on-road signs at either end of the route (and sometimes along the way), flashing lights on vehicles, “competent” staff (of both the adult human and canine variety). You see our road is now a 100km/hour road, frequently travelled by speed-boat towing Nissan navaras, overloaded & inadequately secured camping trailers, prime mover container truck driving cowboys, stock savvy livestock transporters, Territory driving travelling salespeople and the odd local. It’s an interesting mix of those travellers clearly familiar with the vagaries of driving on country roads and those hell bent on getting where they are going at break neck speed. The latter it seems are only too happy to ignore our signs, flashing lights and mad arm waving leaving it to the last minute to brake when confronted with the prospect of wearing a mob of sheep or cattle on the bonnet of their car. The looks on their faces range from surprise to annoyance and rage. We have lost count of the nummber of people who have verbally abused us for delaying their journey, car loads of folk on their way to golf can be, it seems, very irate at the possibility of missing their designated tee off time. It is far more enjoyable for us to see children in the back seat of cars taking delight in seeing the stock at such close proximity or to see the look on a drivers face when the bull admires his reflection in the tinted glass!! Yesterdays mustering job took some doing. Mooreheads is a big paddock and as is often the case, the mob of ewes and lambs were in the furtherest corner when Tim, Ben and Des (the dog) arrived at the gate. Ewes with lambs at foot can be difficult to muster as the ewes are concerned to keep the lambs with them and you don’t want to exhaust the mob before the walk has begun. Slow and steady is the name of the game. Once out of the paddock and on a dirt road bounded by roadside fences the mob moved forward at a good pace. Out onto the asphalt and with a ute in front and behind and Tim and Des on foot we were all heading to home. Halfway up the first hill at O’Dwyers, Tim had the chance to pick up twin lambs out of the mob, probably only a couple of days old. We still had a long way to go, too far for such little legs, and there was traffic coming from both directions, cars and trucks. But where to put them? 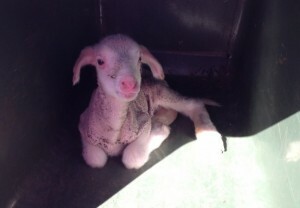 Neither ute had a crate on and anyone who knows little lambs knows they won’t sit still on the seat beside you. I was driving the ute up front and amongst the stuff in the back was the rubbish wheelie bin, lying on its side. 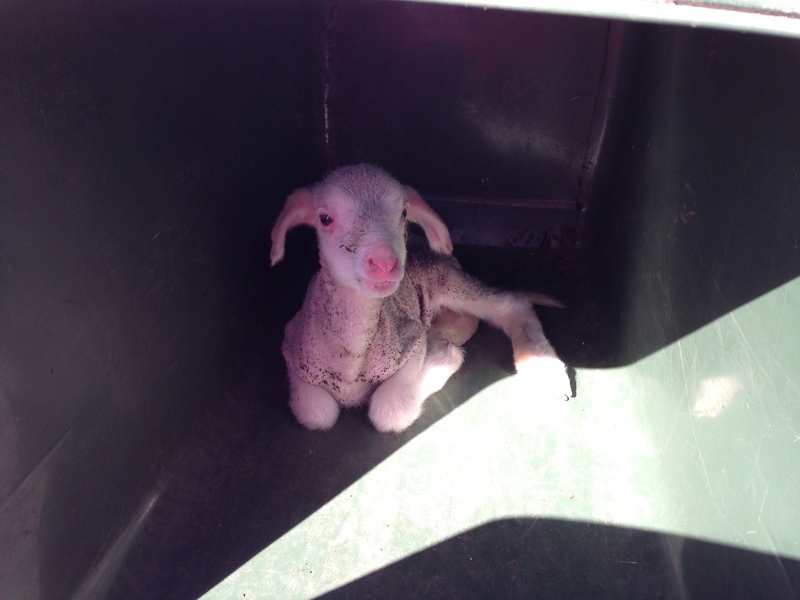 Said bin can now be referred to as a temporary lamb containment facility! Both lambs went in with the lid wedged slightly open for the trip home. Of course, they had other ideas and before long were free-wheeling in the back of the ute. Not a good idea. I was stopped when they made the great escape so one went in the ute with Ben and Fly (the other dog) at the rear of the mob and the other in the front with me for the rest of the trip. Once home and near the yards the twins finished the journey on foot with the mob and found their mum, they’ve spent last night with her in a separate pen to recover from all the excitement. Many farmers all over the country have the need (and the right) to move their stock on their local country roads. They do it with preparation, care and responsibility. 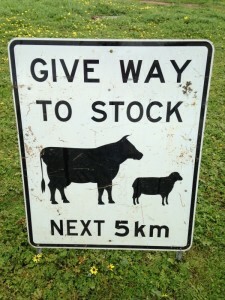 If you are reading this and drive on country roads, please take notice of stock-on-road signs. They are there for a reason and the message should be clear – slow down and drive carefully, it’s as much for your safety and the safety of the other road users as it is for the safety of the stock, the farmers and the dogs. At the very least by slowing down you might see something interesting, even something funny, like two lambs in a wheelie bin!